Volkswagen CC Review 2019 | What Car? The VW CC has been quite a success, with more than 300,000 sold worldwide since the original VW Passat CC was launched in 2008. Standing for Comfort Coupé, it offers four-door practicality with a bit more glamour than the more staid saloon on which it’s based. There’s good news in the engine department, too. The base 1.4-litre petrol is quick enough and fairly frugal but most will be more interested in the punchy yet economical 2.0-litre diesels. Emissions may not be quite as good as some rivals, but the most popular 148bhp diesel manages a respectable 118g/km of CO2, enough for a benefit-in-kind (BIK) rate of 23%. The CC is expensive when compared to more conventional saloon rivals, but counters this with a generous level of standard equipment. 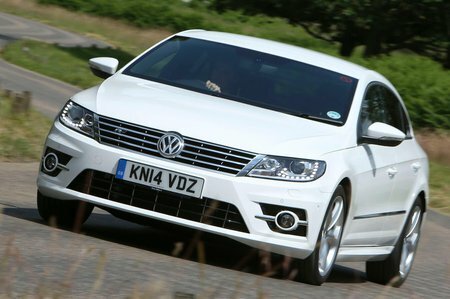 Even the lowliest CC receives sat-nav, a DAB radio, two-zone climate control and automatic bi-xenon headlights. Just bear in mind that the sloping roofline does eat into rear head room when compared to a regular saloon. When combined with a high window line and the tinted rear windows of some models, the rear can feel a little claustrophobic. It’s also worth remembering that despite being a coupé, the CC won’t provide you with a particularly engaging drive. This is more a comfy cruiser than the kind of thing you’d enjoy hammering down your favourite piece of road. On top of that, the optional 19in wheels may look great, but they do have a negative impact on ride comfort.